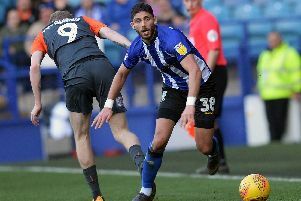 Sheffield Wednesday are said to be in the market for a defender and Wolves’ Danny Batth has been linked with the Owls – so what do fans need to know about the 27-year-old? Batth won’t be a complete stranger to Sheffield Wednesday or Sheffield United fans, as he has spent time on loan at both clubs before. After coming through the Wolves youth system, he spent time on loan at Colchester United, before a single appearance on an emergency loan at Sheffield United in 2010. He had two spells at Wednesday at the end of the 2010/11 season and then for the entire campaign in 2011/12. The 6ft 3in centre-back scored two goals in 54 outings for the Owls and has made 310 career appearances in total in League One and the Championship. He’s an aerial presence and is of an age where his experience should mean he could slot straight in to Jos Luhukay’s team if needed. Batth is said to be a good dressing room personality and is eligible to play for both England and India. Despite entering into talks and stating his intention to play for India, residency rules mean he has not yet been able to make an appearance in the national team. The 27-year-old isn’t known for his ball-playing ability or distribution from the back, but could shore up the Owls defence.